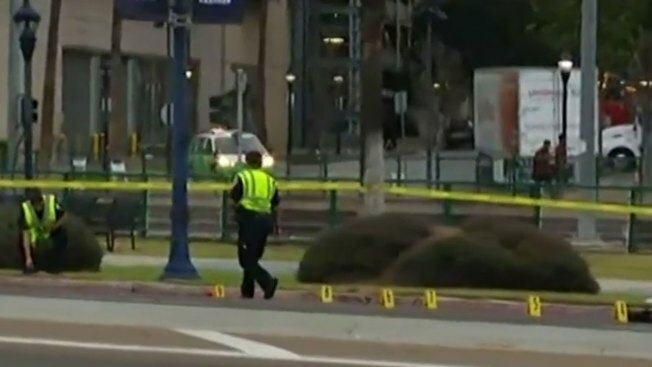 A woman died from injuries suffered in a hit-and-run collision at what has been one of downtown’s busiest pedestrian intersections during Comic-Con 2015. San Diego Police are investigating the crash that occurred along Harbor Drive near the San Diego Convention Center. Officers were called to the corner of Harbor Drive and 5th Avenue just before 4 a.m. They say the woman, described as a 40-50 year old, was crossing from the Convention Center side of the street when she was struck by a car traveling westbound. San Diego Police described the suspect vehicle as "a small silver Ford with front-end damage including the headlight assembly." The intersection has been packed with crowds for several days due to the Comic-Con International convention. The nearest crosswalk is located 25 feet away from where officers were collecting evidence. Comic-Con 2015 wrapped up its stay at the convention center Sunday. Anyone with any information on this case can call the Crime Stoppers anonymous tip line at (888) 580-8477.